Samsung is expected to begin producing 14-nanometer application processors for Apple, Qualcomm and AMD around the end of the year, according to ZDNet. The South Korean company has built custom mobile chips for Apple since the launch of the first iPhone in 2007, but recently has seen its position reduced. Prior to the launch of the iPhone 6, Samsung manufactured all of Apple's low-power ARM processors at its factory in Austin, Tex. But starting with the A8 CPU in the iPhone 6 and iPhone 6 Plus, Apple brought rival chipmaker Taiwan Semiconductor Manufacturing Co. into the fray. Samsung is said to still be supplying about 40 percent of Apple A8 chips for the iPhone 6 and iPhone 6 Plus. But that's still a big change from previous-generation chips, when Samsung was responsible for all manufacturing. 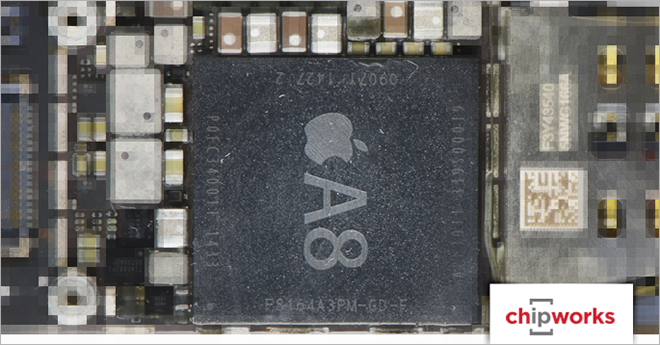 As for the anticipated next-generation "A9" chip, rumors had previously pegged 2015 for a 14-nanometer ARM CPU debut. This year's 64-bit A8 chip is manufactured through a 20-nanometer process, which itself was a reduction from the previous A7 processor. Smaller processors are more efficient, resulting in power savings that can allow devices like the iPhone to see improved battery life, even as the chips themselves become more powerful and capable. The Apple-designed A8 chip has been found through independent benchmarks to outperform the competition while still offering excellent battery life in the iPhone 6 and iPhone 6 Plus.